Hello, Alicia with you today continuing the Christmas in July celebration. Recently, I lucked upon the perfect new die for this project. I am using the papers from the Serenade collection which is not quite yet available but should be able to purchase in time to create Christmas cards. When the card is open it reveals a die cut sentiment. 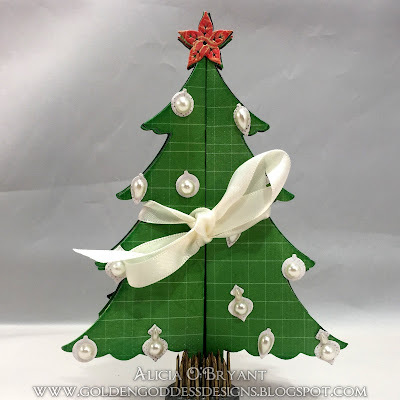 I added a white tree layer so the red sentiment would really pop! 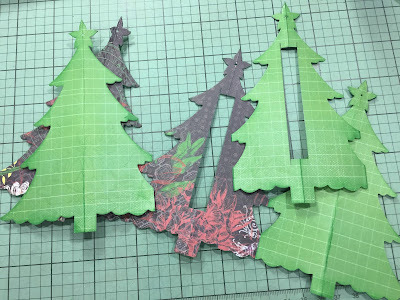 I also added some tiny die cut ornaments. I cut them out of the red and white papers several times. On the front I coated the white ornaments with a shimmer pen and then added pearls for an elegant effect especially when combined with the white satin ribbon that keeps the card closed. On the inside and back panels I simply edged the red ornaments with Barn Board PowderPuff Chalk Ink. I cut the star in red a few times adhering the first one to only one side of the tree on the front to allow for opening. I put one on the inside and back panels. The ribbon is tucked behind the back panel so it will remain attached. Quick Quotes papers cut beautifully in manual die cutters. 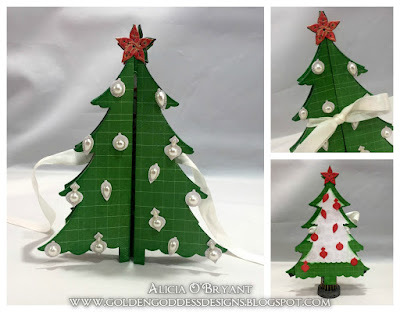 The paper is sturdy enough that the card stands on its own and makes a beautiful display. I cut the card base twice since I desired the entire tree to be green. Isn't the alternate side of the paper gorgeous? I cut the panels apart for the second cut so the card would fold easier. I always chalk all the edges before I adhere just in case there is an edge you can't reach once it is taped. 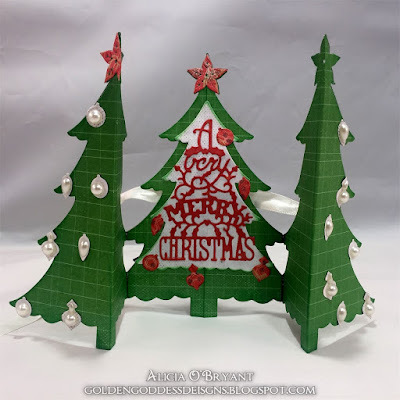 I hope you enjoyed my tips for die cutting not just a card but a wonder filled display!